Check out this new video from C3YoYoDesign team members Ethan Wong and Jackey Li…the music is NSFW, and the tricks are *NSFA. 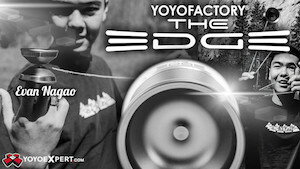 Yoyo used is the Mo-Vitation by C3YoYoDesign. The #trickcircle tag on Instagram is blowing up with yo-yo players sharing their tricks, and we here at @Yoyonews are picking out the best ones to share every week. This second installment also features our first batch of mini-interviews, in which Yuji sheds light on the thinking behind his combo and Mark questions just what the heck “flow” is supposed to mean anyways. More bangers from John Ando, Malcom Chiu, and more after the jump. @johnando starts the week off with a huge bang, or rather two: back-to-back bangers in this video, and a second round of brilliant concepts in another. John Ando is perhaps most often remembered for his 2008 World-winning freestyle when he reminded everybody that a trick could be compelling with only a few string hits, and his opening wrap to trapeze proves this to be as true as ever. John is also a world-class 2A player, which surely informs his movement-oriented style and gives you an idea where the idea for a wrap like that comes from. The trick that follows is just as gnarly: while he can make a single string hit look good, he is in no way limited to simple tricks, and sequences like this rack up the points quick. This combo has a particularly satisfying punchline in the form of an elbow slack catch which sets up into a ripcord release, the impact of which is greatly increased by John’s performing it behind his shoulder. There are very few players who can space their tricks the way that John does, and I dearly hope we see more #trickcircle tricks from him soon. Maclean #trickcircle. Puffin #clyw thanks for all the love! Yoyonews: What, if anything, was the genesis of this trick? Was there a theme you wanted to explore or did the moves just gel together? Mark Mangarin: I was creating an extension to a combo that Adam Schultz was working on when I was hanging out with him and Andrew Maider in NYC — ideas from this were adapted into the first segment. The rest was made in conjunction, but it’s part of a much longer trick that doesn’t fit in the instagram time limit (:15 goes by so fast). Theres a debate about the concise definition of ‘flow’ going around right now, so I’m playing around with different approaches. YYN: What is your personal definition of “flow”? I don’t think theres a specific definition. Going by what the community considers flow, then both JD and Sid have “really good flow” so it’s wrong to consider flow as the smoothness about specific physical motions. It has more to do with one’s timing/execution, but it can be uniquely good per person and what’s considered good flow can change over time very quickly, so I think of flow as a vague/undefined subset of someone’s execution style and trick construction. YYN: What would you consider the centerpiece or main idea you’d like to communicate with this trick? MM: Personally I think the execution, but the reverse quarterstack whip is a big takeaway too. It’s the easiest to explain compared to the rest of the trick, but a reverse quarterstack mount leaves you with many options because you can drop the loop using your elbow. YYN: The drop before the reverse quarterstack (trapeze-brother elbow catch) seems somewhat different from your usual combo construction. What are the benefits and disadvantages of including a pause like that in a trick? MM: I usually never drop strings/mounts randomly as it can make tricks look shallow. I’m just messing around with different things right now, as #trickcircle seems like a good outlet to share ideas including those not fully developed. I think it gives more attention to the whip, but maybe someone out there can make a full drop look good? While the community may be a ways off from agreeing on a definition of “flow”, few would disagree that @andrewbergen has it in spades. His first entry into the #trickcircle canon, titled “jsmy”, opens with what appears to be a shockwave-inspired chopsticks combo that sets up a lovely falling slack whip before folding its way into a complex triangular string formation. Much of this trick’s strength comes from the sense of rhythm that it establishes early on with back & forth motions, and we at Yoyonews are all hoping that Andrew graces us with some more choice bits of tech soon. Yoyonews: What, if anything, was the central idea behind this combo? What did you want to showcase or express most? Yuji Shimokawa Kelly: The central element I wanted to showcase is the slack drop which happens just where i’ve selected the screen cap. I wanted to create an effect where i would drop the slack with my arms pointed to the right, and then dismount using the same movement to the left. This was the first time I’d actually filmed it, and I can see that it doesn’t work quite as well as I had hoped. YYN: Looks good to us. Do you name your tricks? YSK: I very rarely name my tricks, and this particular one I don’t think is name worthy just yet. YYN: Would you say this trick is “finished”? How can you tell when a trick is complete? In terms of the combo, far from it. I don’t think first and second half will ultimately be part of the same combo, I just wanted to fit them on one clip. Watching the clip back, I’m finding a couple of little things I can change to improve it. YYN: We’ll be excited to see what this turns into, thanks for the look! Taking a quick trip from England to Hong Kong, we have @jackey_li of team @c3yoyodesign showing us just how good slack can look in slow motion. Slomo really helps break down the subtleties of the trick here, and the fact that it’s only a few moves makes it very tempting to learn. Just because it’s short does not mean that it’s easy, and Jackey packs some serious depth into it: in addition to looking pretty, the opening rejection sets up a clever slack move that gets the strings in place for the following sequence of pops culminating in a triangle. If you’re anything like us, you probably had to watch the latest tricks from @meowcolm (AKA Malcolm Chiu of Duncan Crew) a couple of times before they made any sort of sense at all. Fortunately, Malcolm’s supplemented the mobile video with an HD slomo clip of some other lassos so you can really gawk at that perfect loop before he hucks it into the gap… but you’re probably going to need some practice before you can get that cross-handed GT down. Apparently, the 720 lasso root trick is Jesse Christe‘s creation, and Malcolm is to be commended for both taking it to another level and properly citing his sources. 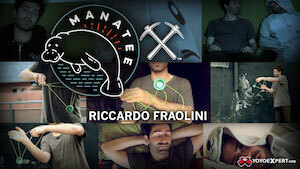 Want more insta-madness? Don’t forget to check out all the videos tagged with #trickcircle and submit some of your own for a chance to be featured next week… and, hey! 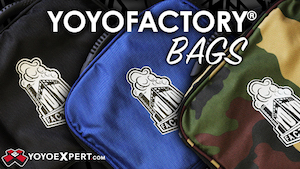 Follow @yoyonews while you’re at it, yeah? Here are some of our other favorites of the week that we didn’t have time to write about. and two-headed monster tricks with Drew & Melissa. C3YoYoDesign team member Jackey Li shows off their Glitter yoyo in this new video. 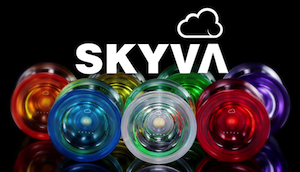 C3YoYoDesign has the absolute best product/team promo videos in the industry right now, hands down. You hear that, everyone else? Your work is cut out for you!